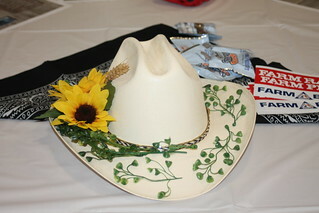 The Marion County Farm Bureau’s Ag Ventures program is held annually during the Southeastern Youth Fair. It is organized and funded by the Marion County Farm Bureau, Marion County Public Schools, the Southeastern Youth Fair, and local agriculture industry. During Ag Ventures, elementary school students are able to learn and get involved in Florida’s 12 major agriculture commodities. They can pet a pony while learning about the equine industry, squeeze oranges by hand and enjoy fresh Florida orange juice and enjoy an ice cream cone as they learn about dairy production. Florida Farm Bureau members and volunteers throughout the community make Ag Ventures a success, year after year.